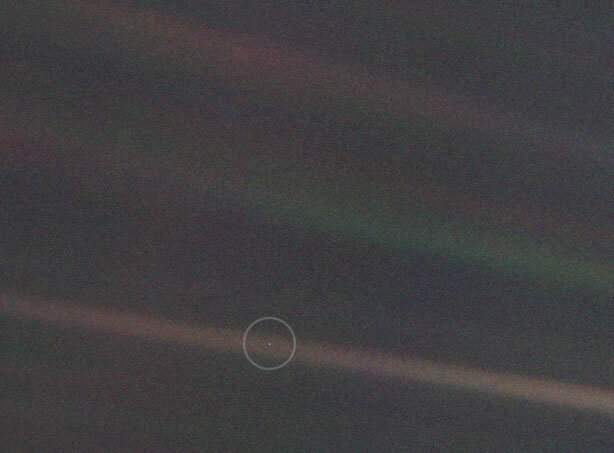 Thanks to the prodding of Carl Sagan, just over 25 years ago, on February 14, 1990 to be exact, the Voyager 1 spacecraft turned its camera towards Earth and snapped what has since become an iconic image. It showed our home planet as a very small, very pale blue dot — much as you’d expect from a distance of around 3.7 billion miles. Though much closer to Earth, the Cassini spacecraft snapped a similar shot of our planet in 2013. Cassini is in its seemingly never-ending orbits of discovery around the Saturnian system, which it began over 10 years ago. 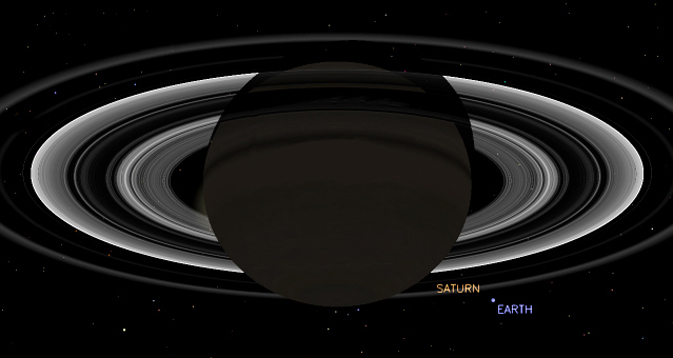 It took the image in 2013: Earth in the distance at the center right is dwarfed by Saturn’s rings in the foreground. A rare, beautiful and remarkable image! 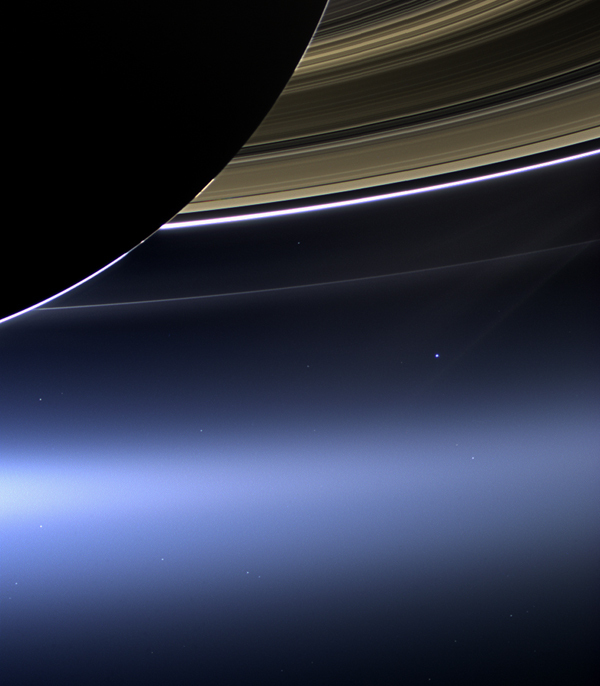 Image: Saturn’s rings and Earth in the same frame. Taken on July 19, 2013, via the wide-angle camera on NASA’s Cassini spacecraft Courtesy: NASA/JPL-Caltech/Space Science Institute. 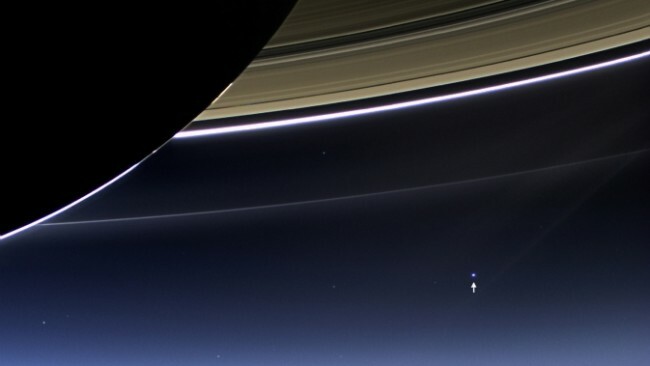 As Carl Sagan would no doubt have had us remember, we are still collectively residents of a very small, very pale blue dot. The image of planet Earth was taken by the Cassini spacecraft, which has been busy circuiting and mapping the Saturnian system over the last several years. Cassini turned the attention of its cameras to our home on July 19, 2013 for this portrait. Color and black-and-white images of Earth taken by two NASA interplanetary spacecraft on July 19 show our planet and its moon as bright beacons from millions of miles away in space. NASA’s Cassini spacecraft captured the color images of Earth and the moon from its perch in the Saturn system nearly 900 million miles (1.5 billion kilometers) away. MESSENGER, the first probe to orbit Mercury, took a black-and-white image from a distance of 61 million miles (98 million kilometers) as part of a campaign to search for natural satellites of the planet. In the Cassini images Earth and the moon appear as mere dots — Earth a pale blue and the moon a stark white, visible between Saturn’s rings. It was the first time Cassini’s highest-resolution camera captured Earth and its moon as two distinct objects. It also marked the first time people on Earth had advance notice their planet’s portrait was being taken from interplanetary distances. NASA invited the public to celebrate by finding Saturn in their part of the sky, waving at the ringed planet and sharing pictures over the Internet. More than 20,000 people around the world participated. Pictures of Earth from the outer solar system are rare because from that distance, Earth appears very close to our sun. A camera’s sensitive detectors can be damaged by looking directly at the sun, just as a human being can damage his or her retina by doing the same. Cassini was able to take this image because the sun had temporarily moved behind Saturn from the spacecraft’s point of view and most of the light was blocked. A wide-angle image of Earth will become part of a multi-image picture, or mosaic, of Saturn’s rings, which scientists are assembling. This image is not expected to be available for several weeks because of the time-consuming challenges involved in blending images taken in changing geometry and at vastly different light levels, with faint and extraordinarily bright targets side by side. Image: In this rare image taken on July 19, 2013, the wide-angle camera on NASA’s Cassini spacecraft has captured Saturn’s rings and our planet Earth and its moon in the same frame. Courtesy: NASA/JPL-Caltech/Space Science Institute. It was Carl Sagan’s birthday last week (November 9, to be precise). He would have been 77 years old — he returned to “star-stuff” in 1996. Thoughts of this charming astronomer and cosmologist reminded us of a project with which he was intimately involved — the Voyager program. In 1977, NASA launched two spacecraft to explore Jupiter and Saturn. The spacecraft performed so well that their missions were extended several times: first, to journey farther in the outer reaches of our solar system and explore the planets Neptune and Uranus; and second, to fly beyond our solar system into interstellar space. And, by all accounts both craft are now close to this boundary. The farthest, Voyager I, is currently over 11 billion miles away. For a real-time check on its distance, visit JPL’s Voyager site here. JPL is NASA’s Jet Propulsion Lab in Pasadena, CA. Some may recall that Carl Sagan presided over the selection and installation of content from the Earth onto a gold plated disk that each Voyager carries on its continuing mission. The disk contains symbolic explanations of our planet and solar system, as well as images of its inhabitants and greetings spoken in 55 languages. After much wrangling over concerns about damaging Voyager’s imaging instruments by peering back at the Sun, Sagan was instrumental in having NASA reorient Voyager I’s camera back towards the Earth. This enabled the craft to snap one last set of images of our planet from its vantage point in deep space. One poignant image became know as the “Pale Blue Dot”, and Sagan penned some characteristically eloquent and philosophical words about this image in his book, Pale Blue Dot: A Vision of the Human Future in Space. From Voyager’s great distance Earth is a mere point of light, less than the size of a picture element even in the narrow-angle camera. Earth was a crescent only 0.12 pixel in size. Coincidentally, Earth lies right in the center of one of the scattered light rays resulting from taking the image so close to the sun. This blown-up image of the Earth was taken through three color filters – violet, blue and green – and recombined to produce the color image. The background features in the image are artifacts resulting from the magnification. To ease identification we have drawn a gray circle around the image of the Earth.